Over the last few days, I have been posting about some of the major items that were on Monday night’s council agenda. Today, I will be posting about the remaining items that were on the agenda. Back in May, a public hearing occurred for a rezoning application for 19942 Brydon Crescent. The rezoning would allow a four-storey apartment building which is permitted under the City’s Official Community Plan. Council gave final approval to the rezoning, and approved the issuance of a development permit for the project on Monday. 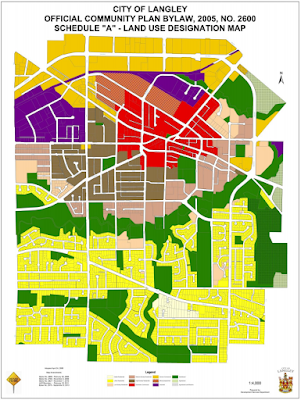 Langley City Official Community Plan land-use map. Select image to download. In addition, 14 other projects received funding in 2017 including a new washroom, storage facility, and additional park benches, picnic tables and a shelter for Penzer Action Park. These additional projects were funded from the Capital Works Reserve, Community Amenity Fund, and the Parks & Recreation Reserve. On the topic of finances, the City grants property tax exemptions for certain properties in our community. These exemptions must be renewed annually. In 2017, the City provided $200,675 in tax exemptions. Church buildings are entitled to a statutory property tax exemption under BC law. The City also generally provides a tax exemption for the full lot that a church building is sited on, as well as to churches that lease land. The City received additional requests for property tax exemptions for 2018, but council decided to maintain the status quo. These exemptions do have a material impact on all ratepayers in our community. For example, if council eliminated these exemptions (which is not being considered at this time), property tax could be decreased by almost one percent. I have always wondered why Grade hasn't been hooked up to 50th. Instead of changing up the lights and sidewalks, why not run them together so that people coming from 50th can make a left on 200th without risking life and limb? With the township trying to make Willoughby south out of Brookswood, the congestion on 200th will be astronomical and accidents are a sure bet to follow, especially in that area. I am also in full support of the interurban; my grandfather used to take it from Burnaby to work in Vancouver and out to Sullivan station to fish the Serpentine. He had such wonderful stories about the line, it would be nice to see it running again.